Last year LBFN moved in to a small office in central London. We joined some great community and artistic groups, including the pioneering SE1 United youth forum, in the Creative Crypt in Waterloo. We have wi-fi, café-style meeting space, loos and a kitchen. There’s even a beautiful place upstairs for quiet reflection and prayer which welcomes people from all traditions – perfect! If you are looking for a friendly place for a small meeting in central London or would just like to visit LBFN, just email or ring ahead on 07903 682 142 to check availability. The Creative Crypt. Ring ahead or take a chance – press the buzzer for no 9 at 73 Waterloo Road, SE1 8TY. We have been warmly welcomed by Canon Giles Goddard and the team at St John’s, which hosts the Creative Crypt. 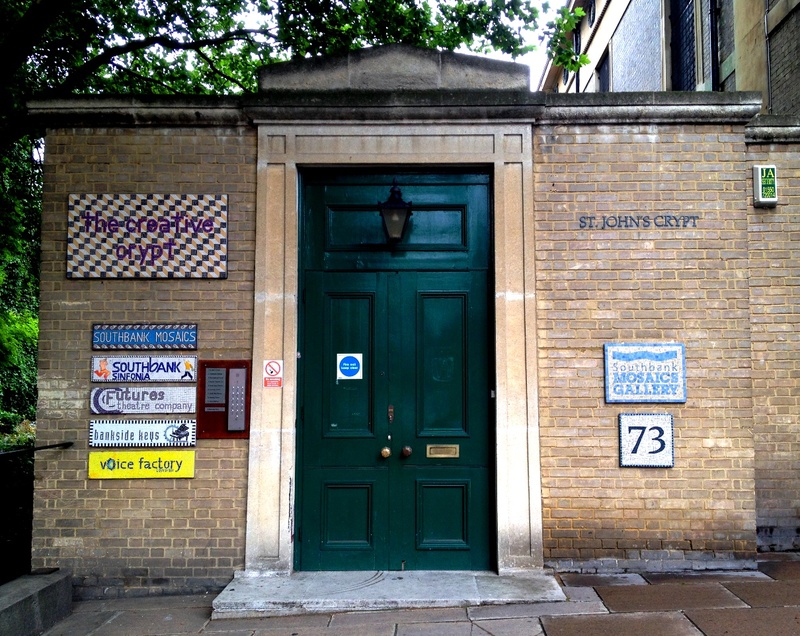 St John’s is a multicultural church with very strong local connections and multifaith links in an area of London which is undergoing significant regeneration. It is also home to the Waterloo Festival. If you drop by and LBFN’s Convener isn’t in, you’ll find a friendly welcome from Sheila Wallis, Front of House, inside the church. There’s a food market outside with a range of delicious hot food (the falafel wraps are fantastic) and fresh Ethiopian coffee. The fair trade shop is open Monday-Friday 10am-6pm and there are free lunchtime and rush-hour concerts. We are on the south side of Waterloo Bridge, opposite Waterloo station, next to King’s College London at 9 Creative Crypt, 73 Waterloo Road, SE1 8TY. The nearest tube is Waterloo and there are plenty of bicycle stands. There’s a flight of stairs down to the office, so those who prefer a flat entrance might be able to meet in the church above – please ring in advance to check. This entry was posted in London, Social Labs and tagged LBFN office, London Boroughs Faiths Network, St John's Waterloo, Waterloo by Catriona Robertson. Bookmark the permalink. Many many congrats – really pleased for you and LBFN. I hope to visit soon – maybe combine it with a visit to the Courtauld. Does that mean that LBFN meetings will now be held in a permanent location? What are your hours there, as I understand you have a job outside LBFN (how you find the time I cannot imagine). Thanks Jackie – look forward to seeing you whenever you come this way! Not too far from the OXO Tower, so maybe combine it with Spirit of Womanhood (which sounds great)? I think we’ll still keep moving around for meetings – it helps us all get a feel of different parts of London, different religious and civic spaces, etc.